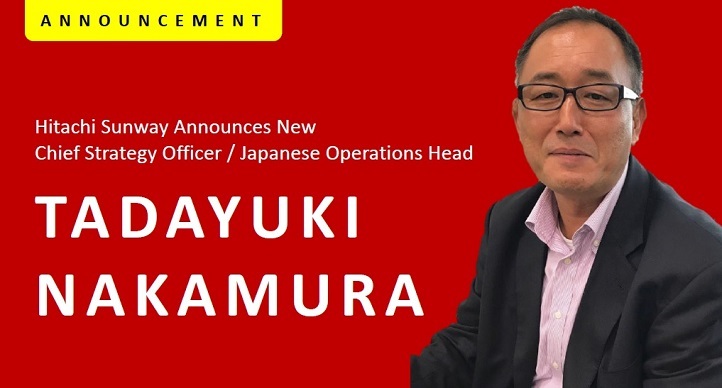 Hitachi Sunway Information Systems (“Hitachi Sunway”) is delighted to announce the appointment of Tadayuki Nakamura, fondly known as Chu san, as Chief Strategy Officer (CSO) and Japanese Operations (JO) Head with effective April 1, 2018. Chu san, who currently serve as Managing Director for Hitachi Sunway Indonesia will maintain this role in addition to his new role. He will be based in Malaysia and he will continue to report to Group CEO / Director, Cheah Kok Hoong. Chu san joined us in April 2013. Prior to that, he was attached to Hitachi Group of Companies for 22 years, where he garnered vast experience in marketing, business strategy planning, sales and promotion. In addition, he developed strong skills in new market and industry exploration, and sales distribution experience particularly in the logistic and automobile sectors. Speaking about his new role, Chu san said “I am honored and excited to have been asked to take on this role. I hope my experiences will further value add to Hitachi Sunway, and bring the company to greater heights and achievements.”. “Over the last 5 years, Chu san has proven himself with his outstanding performance. I am certain he will continue to work closely with the team and lead Hitachi Sunway into the next stage of its strategic development” said Cheah Kok Hoong, Group CEO / Director. We wish Chu san best of luck in his new roles and we are confident he will thrive.